Flute Concerto in G Major K313 composed by Wolfgang Amadeus Mozart (1756-1791). Edited by List / Thiele. For flute, piano. This edition: Urtext. Sheet Music. 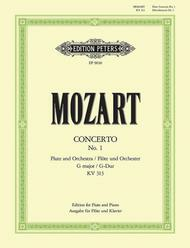 Published by Edition Peters (PE.P09030).Sheet Music & MusicPartner accompaniment CD Pack available (Q9030)Flute and Piano (with cadenzas).